A World That Defies Time! "Sonic, where are you going now?" Sonic the Hedgehog looked over his should at Princess Sally, the young hedgehog who was racing hot on his heels. "To Never Lake." he called back. Sonic slowed down a little so he could explain. "Ever heard of the Little Planet?" "Isn't that the tiny world that orbits around Mobius?" Princess Sally asked. "The one with the special stones that alter time and change everything around them? I heard that the planet's full of places that are completely ignored by the passage of time!" "Yeah. On the last month of every year, the Little Planet appears over Never Lake. It's that time now and I'm going to check it out. I bet space travel will be exciting"
"With all those Time Stones, I bet you'll try to outrun time itself!" Princess Sally sighed in adoration. Sonic didn't reply. He just smiled, eyes gleaming. When they arrived at Never Lake, the Little Planet was there as expected. But something was wrong. Where there should have been tall trees and bright flowers, there was nothing but dry sand and jagged rocks. The Little Planet was tethered to a rock with a huge chain, and its surface was covered with twisted gleaming metal. "What Happened?" Princess Sally wondered. Before Sonic could reply, something whooshed over them. Princess Sally shrieked as she was snatched up, and she and her captor vanished in a blue streak of light! It didn't take long for Sonic to realize what had happened. "This has to be one of Dr. Robotnik's Tricks!" Indeed it was! Upon discovering the location of the Little Planet, the evil Dr. Robotnik and his robot cronies had immediately set about converting it to a giant fortress. When Robotnik saw Sonic approaching, he had dispatched his prize creation, the Metal Sonic, to grab Princess Sally and lure his arch enemy into danger. "How convenient!" Robotnik crowed, bouncing about like a malicious rubber ball. "This time my scientific expertise will crush you! Once all the Time Stones are in my hands, I'll be able to manipulate time and conquer the world! HO, HO, HO, HO!" Sonic stood on a rock and though. Robotnik had control of the Little Planet. He had Princess Sally, and soon he would have the Time Stones... But not if Sonic got to them first! His adventure on the Little Planet was going to be more exciting and dangerous then he'd planned. It was time to get a move on! Sonic the Hedgehog looked over his should at Amy, the young hedgehog who was racing hot on his heels. "To Never Lake." he called back. "Isn't that the tiny world that orbits around Mobius?" Amy asked. "The one with the special stones that alter time and change everything around them? I heard that the planet's full of places that are completely ignored by the passage of time!" "Yeah. On the last month of every year, the Little Planet appears over Never Lake. It's that time now and I'm going to check it out. I bet space travel will be full of excitement!" They left the Mountings and arrived at Never Lake. The Little Planet was there as expected. But something was wrong. Where there should have been tall trees and bright flowers, there was nothing but dry sand and jagged rocks. The Little Planet was tethered to a rock with a huge chain, and its surface was covered with twisted, gleaming metal. "What in the world happened here?" Before Sonic could reply, something whooshed over them. Amy shrieked as she was snatched up, and she and her captor vanished in a blue streak of light! "This has to be Dr. Robotnik's doing!" Indeed it was! Upon discovering the location of the Little Planet, the evil Dr. Robotnik and his robot cronies had immediately set about converting it to a giant fortress. He'd seen Sonic ap-proaching and had dispatched his prize creation, the Metal Sonic, to grab the girl and lure his arch enemy into danger. "How convenient!" Robotnik crowed, bouncing about like a malicious rubber ball. "This time my scientific expertise will crush you! Then once all the Time Stones are in my hands, I'll be able to manipulate time and conquer the world! HOOOO, HO, HO, HO!" Sonic stood on a rock and though. Robotnik had control of the Little Planet. He had Amy, and soon he would have the Time Stones... But not if Sonic got to them first! His adventure on the Little Planet was going to be more interesting the he'd anticipated! For one month out of every year, a tiny planet appears in the skies above Never Lake. The mysterious Little Planet is home to seven miraculous gems that control the passage of time. When these Time Stones awaken, deserts revert to jungles and polluted waters become pure again. Intrigued by the unusual power of these stones, Dr. Eggman sets his sights on Little Planet. As soon as it appears in the sky, he chains it to a nearby mountain and, utilizing the planet's lack of boundaries on time, conquers the past so that he controls the future. Sonic, meanwhile, is on his way to Never Lake, completely unaware of Eggman's latest ambition. Our blue hero arrives on the shores of the lake and is shocked to see the legendary Little Planet chained to the local terrain. It doesn't take him three guesses to figure out the perpetrator of this deed, so he dashes up one of the chains to free the planet and throw a wrench into his rival's latest scheme. Unfortunately, Eggman has been clued in to his enemy's arrival, and preparations have already been made. Meanwhile, a young girl hedgehog named Amy Rose (aka Rosy the Rascal) is lured to Little Planet by a card reading that told her of a destined encounter with Sonic. Once there, Amy becomes the perfect target for Eggman to make sure he's got Sonic's attention and to show off his latest, most sophisticated creation to date: Metal Sonic. This robot duplicate of our hedgehog hero was designed to match Sonic's every move and even surpass his own namesake speed. This deadly new rival kidnaps Amy in front of Sonic's very eyes and escapes with his prize to Eggman's base. Each Level is cut up into 3 Acts. Act 1 & 2 each have 3 Time Zones, 'Past', 'Present' and 'Future'. Act 3 Also has 3 Time Zones but they are 'Good Future', 'Normal Future' and 'Bad Future' depending on Events in the Past of the first 2 Acts. Act 3 has the Boss Fight. Level Select - On the Title Screen, Press Up, Down, Down, Left, Right and B. This cheat seams to be a bit tricky to work and for some reason it seams to be easier IF you press the buttons gently. Cloud Change - On the Title Screen (while 'Press Start' is displaying), Hold A and Press Up, Down, Down, Down, Down and Up. You can then use the pad to change between Two Cloud types as well as a couple of other effects. Sound Test - On the Title Screen (while 'Press Start' is displaying), Press Down, Down, Down, Left, Right and A. You will then Enter the Sound Test. Time Attack- Music Test - Play the Time Attack Mode and get a Total time of Less then 37:27:57. Go to the Title Screen and left of 'RAM Data' you will see 'D.A. Garden. You will be shown a picture of the Little Planet. Press B and the Direction Pad to rotate the Planet, Press C and the Direction Pad to Zoom in and Out, Press A to play Music from the game. Time Attack- Special Stages - Get a Total time of Less then 30:21:05 and on the Time Attack Screen, Press Left and you will be able to play the Special Stages. Time Attack- Video Player - Complete the Time Attack with less then 25:46:12. 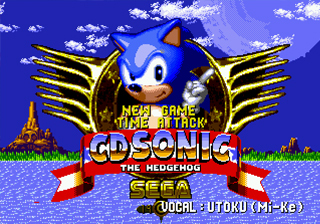 On the Title Screen, Left of D.A. Garden will be 'Visual Mode'. This will let you play the Video Sequences. FM40-PCM12-DA11 - Debug Mode (with Hidden Image #5). 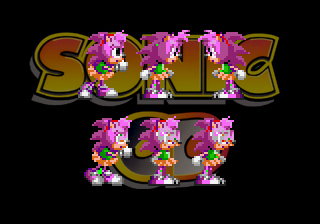 Via hacking Sonic CD, fans have found a number of 'unused' Amy Frames. The First appears to be much like Amy's Normal 'Hugging Sonic' Frame but with a different pose for the feet, maybe it was part of a 2 framed Animation which was cut down into 1 frame in the end. The next two frames are pretty much the same but feature a couple of 'mistakes' which might be due to image ripping or just they weren't complete, the Right looking one shows No hair band, This also seam to start the 'hearts in the eyes' animation we'll take about next. The Final three frames show Amy rose with Hearts in her eyes.. not very easy to tell that due to the size and detail (probably one reason the animation was removed and replaced with 'floating hearts') but they are Basicly Amy's 'Hugging' Frame and two frame standing. 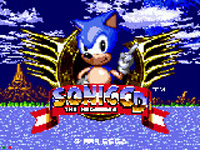 Most Early production stuff for Sonic CD will tell you that before it got as far as being called Sonic CD, it was known as CD Sonic. This title screen from an early build. There doesn't appear to be much in the way of major changes but some of note. First is the Title saying 'CD Sonic' Not Sonic CD. The Second is the Large 'SEGA' logo and Vocal Credits. The Background Mountains appear very much different too, as well as different clouds and the Little Planet looking completely different. The Other notable change is the Selections. This has new Game and Time attack ABOVE the Sonic Banner. The Final game has one item appear at a time and below the banner (in white, not yellow too). It also appears that Sonic is much larger on this version then on the final one too. 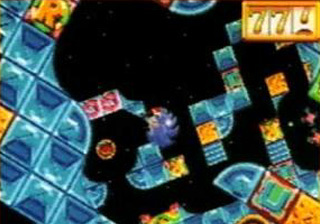 A Screenshot shown in Sonic Jam shows something interesting. It seams at some point, Amy Rose was set to appear in Palmtree Panic when in the final version, she only appears in Collision Chaos. You find Amy at the end of the first act of Palmtree Panic. She will follow you a little bit, but if you get too far she will just stand still with hearts floating up. If she 'catchess' you, she will grap hold of Sonic, requiring you to jump to get out of the 'hug'. Probably removed for Story reasons. 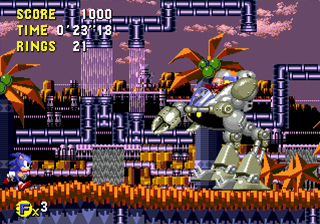 An early build of Sonic CD has Robotnik's EGG-HVC-001 machine (first level boss) with Claws instead of bumpers. These basicly do the same job however. 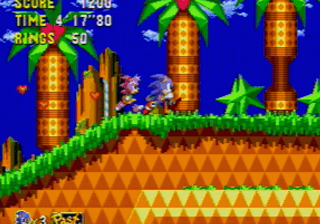 An early build of Sonic CD has the Bad future of Tidal Tempest (in the final act) as a lot more Robotic then the final version. There are a few objects (like the Direction changers from Quartz Quadrant) and a few others details too to show what this bad future could be. As part of an in-joke on an early build of Sonic CD, when the Demo runs, A message flashes on the screen. 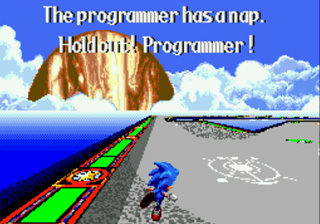 "The programmer has a nap. Holdout! Programmer!". Many jokes like this appear on early builds for in-house or press-releases on many games. 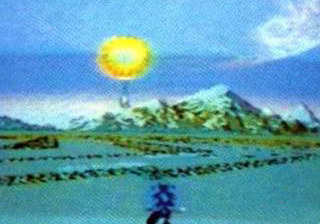 An early build of Sonic CD (still under the CD Sonic name) had the Special Stages with Balloons instead of the UFOs. It is unknown from when this image was found, but probebly early on. 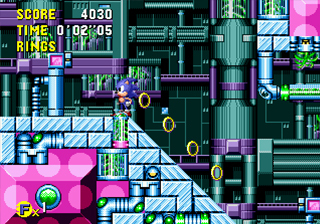 There are many Sonic 1 references in Sonic CD in it's whole design and that seams to oringally carry on to the special stage as well, as this show a Sonic 1 like Special Stage.